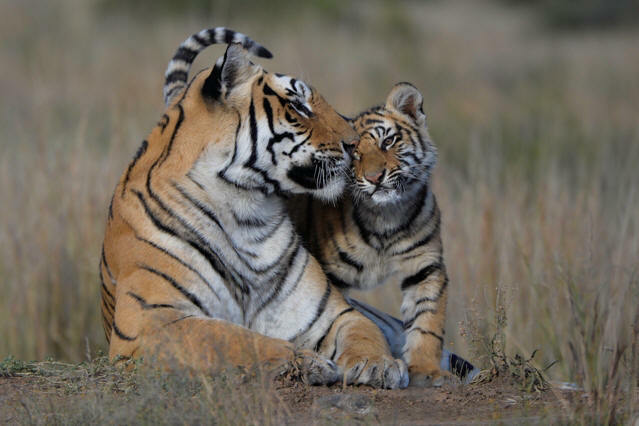 SM: JV, Tiger Canyons is now rated as the best place to photograph wild tigers. How have you achieved this? JV: I believe the light at Tiger Canyons is one of the factors. The light especially in the afternoon is some of the best I have ever filmed and photographed in. Also the landscape is so diverse. 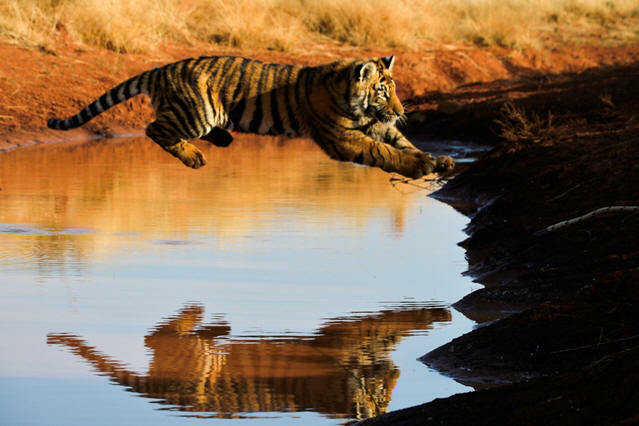 One can photograph a tiger posing on the rocks, stalking through golden grass or swimming in a river. This is special. The ability to shoot high angle and low angle is a big advantage. SM: You have filmed and photographed all the big cats, which photographs the best? JV: You can't really compare them. 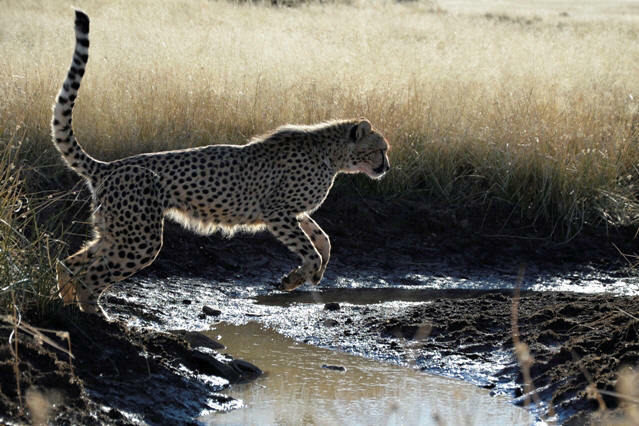 A cheetah running at full speed should be shot on movie at 100 frames per second. A tiger glowing in the golden afternoon light is a better still shot. The advantage with the tiger is it is a very diverse cat. It will swim for fun, it will hide kills in water, it will take kills into trees like a leopard and it will quite happily stroll across a plain in the open like a cheetah. Tigers have varying personalities, so they do a variety of things which provides diverse opportunities for photography. SM: You describe some tigers as ambassador tigers. What is an ambassador tiger? JV: An ambassador‎ tiger is one that instinctively knows that it's survival and future is tied somehow to the camera. Julie was the ultimate Ambassador Tiger. Many times she would bring her cubs out of the dense reeds into the open to be photographed. Ussuri is another Ambassador Tigress. Ussuri goes out of her way to share her cubs with the photograpers. SM: Give an example of a non-ambassador tiger! JV: Sariska doesn't like being photographed. He will often move away or simply turn his head away from the lens. His sister Panna also moves into tall grass or heavy bush when the photographic jeeps arrive. You must remember that a black lens represents a large round dark eye, this is a very aggressive object in the tiger world. SM: How important is the behaviour of the photographer to getting good pictures? JV: It's very important. The tiger will pick up the energy and the mood of the people in the jeep. Loud, aggressive demanding photographers generally don't get good pictures. I always tell the photographers, "be patient and let the pictures come to you". I always greet the tiger when I find it, to calm them and reassure them and I always thank them for the sighting when I leave. I encourage the photographers to do the same. SM: Do some photographers demand to see tigers &‎ to get good photos? JV: It is not a right to see tigers at Tiger Canyons, it is a privilege. The tigers are not obliged to give up their time and their space for human beings to take pictures. 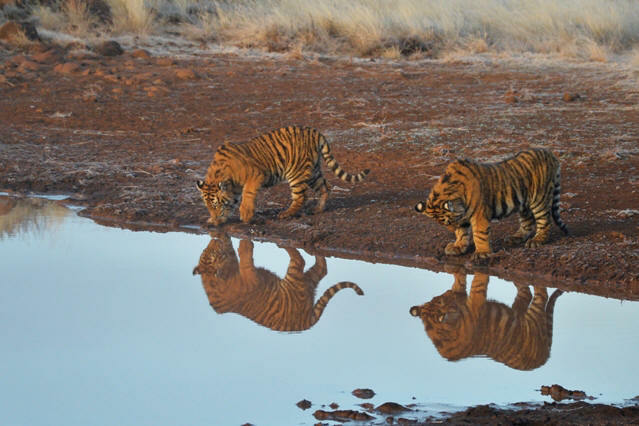 Photographers should rather see themselves as joining a giant experiment which documents the lives of wild tigers. SM: How big a photographic attraction is Tibo, the white tigress? SM: How often can you find her? JV: Mostly we can find her, but recently we did a safari with people from the USA and in 5 game drives, we were unable to find her once. Tibo can be quite moody, if she feels like being photographed, she will pose. If she doesn't, she goes into reeds and thick bush and remains hidden. SM: When will she produce her first litter of cubs and will they be white? JV: I am hoping to mate Tibo with a normal male so that all the cubs will be normal coloured carriers. Our objective is wild born, wild raised, normal coloured tigers. 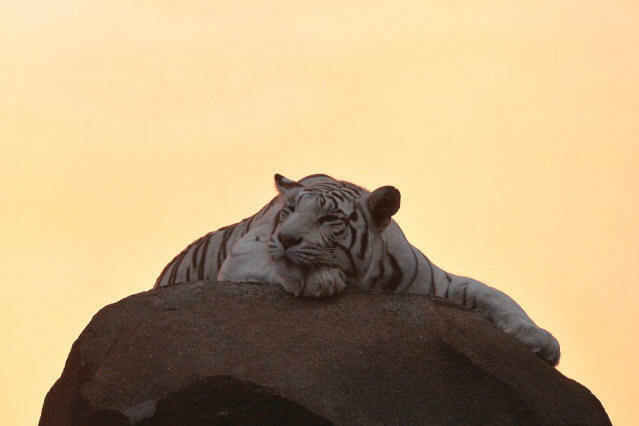 We would like to preserve the rarity of the white tiger. SM: When your 3 areas become one large area, won't it become more difficult to find and photograph tigers? SM: How will the tigers cope in the big area as far as hunting goes? JV: I think initially, they will find it more difficult to hunt. On the other hand, with more land we can stock more prey and a wider diversity of prey. 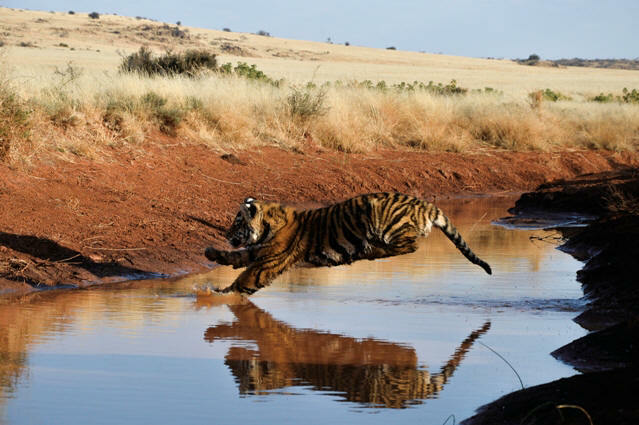 There is no doubt, to capture high action hunting sequences will remain a big challenge for the filmmakers‎ and photographers. SM: There seems to be many international film crews visiting Tiger Canyons recently, why is this? JV: I think the demise of the tiger in Asia and the bureaucratic attitude towards tourists and filmmakers in Indian parks means that filmmakers that previously went to India and Nepal are coming to us. Also we have been researching the tiger for 14 years and much new behaviour has been filmed and documented at Tiger Canyons. Film producers want this new information to give their film an advantage in the marketplace. SM: Do you photograph and film everyday? JV: The good, the bad and the ugly is filmed and photographed every single day at Tiger Canyons. SM: The good photographers and filmmakers that visit Tiger Canyons, what are they like as individuals? JV: Generally skillful, tenacious, creative, inventive, patient, sharing and knowledgeable...a pleasure to be with. I have learnt a huge amount from the photographers and filmmakers and the best pictures circling around the world are not taken by me, they are taken by visiting photographers. 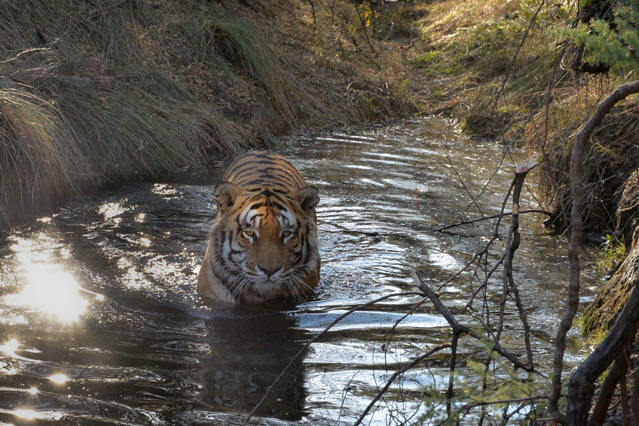 SM: You have described digital photography as a major step forward in the conservation of the tiger. How so? JV: It's not just the conservation of the tiger, it is by extension, survival of all cats, all wild animals and wild places. Any person today with a digital camera can capture a unique picture. So their interest in photography leads them to an interest in the subject of photography, which leads them to the tiger. Should the wild tiger become extinct, the photographers would have lost a major opportunity for photography. Therefore the photographers join the fight to save wild places and wild tigers and photography is the catalyst which brought them there. SM: Which is the better camera - Nikon or Canon? JV: I have no idea. In truth I know almost nothing about cameras. I get other photographers to set my cameras for me. The challenge for me is the ability of the picture to communicate. Before a government could destroy a tiger's forest, now they can still destroy that forest but I can film and photograph that destruction. In addition, I can communicate that destruction instantly around the world. This for me is the power of photography. 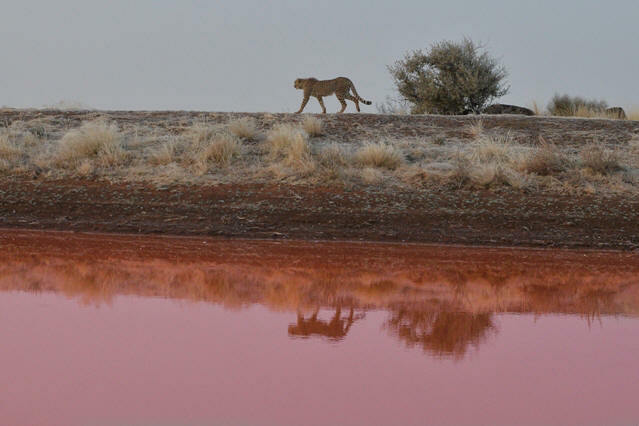 SM: Where is the future for wild life photographers? JV: Photographers must not compete, they must complement. They must expose their pictures to a global audience. The pho‎tographers are the cog in the global brain, the gears that drive the communication revolution forward. 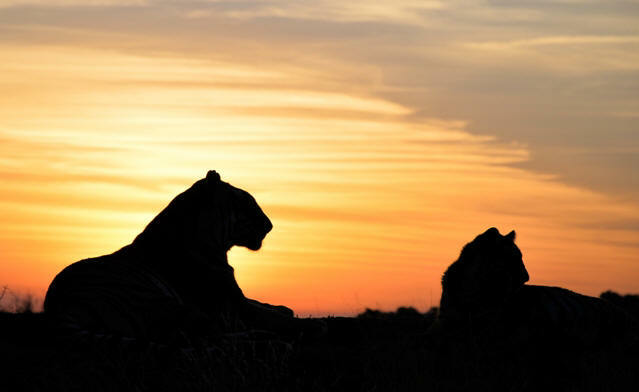 We are already seeing photography as a powerful tool in the war against rhino poaching, the tiger body-parts trade, cruelty to animals, pressure on wild animals in circuses. We are the first generation of photographers to have Facebook and YouTube at our disposal, we must use it to our full advantage. Pictures can embarrass governments, change attitudes, influence decisions. Gone are the days when your pictures collect dust in some cupboard. They must work to influence for a better world. Our failure to use our images will result in a world with no wild places and no wild tigers and nothing wild to photograph. A world of man-made concrete and steel overrun by one species... human beings. In the coldest winter ever at Tiger Canyons, Ussuri's cubs try to break the ice on la Vea Dam to reach the water underneath. 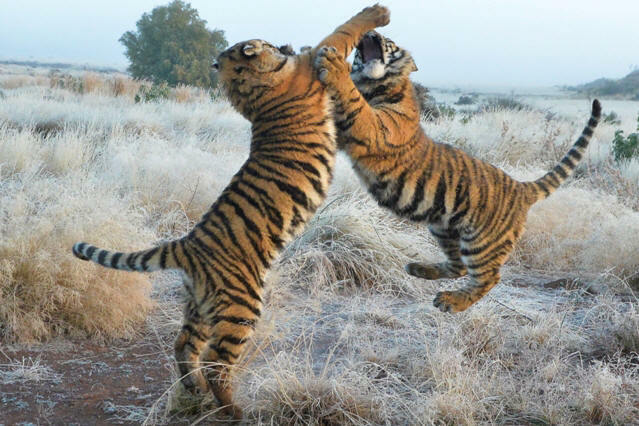 Ussuri teach the cubs how to do this.